Summary : If you are searching for a spicy tea, then this tea isn't for you. Instead, I'd classify this as a green tea with just a "bit of an attitude," as the spice is very, very subdued. In some ways, I would classify this almost as a "comfort tea," as the tea is oddly comforting to drink. Review : Me and chai teas are meant to get along, I guess. To date, I have yet to try a chai tea that I didn't classify as at least three stars on this website. Most likely, it is because I just love spicy things...whatever it happens to be. Sure, like all things, some chai teas are better than others, but at the end of the day, I just love spice and hence I just love chai teas. Since chai teas are usually found in black teas, I'm always curious to try a chai tea that is NOT a black tea. As such, I was looking more than a little forward to try a tea from the Dragonwater Tea Company (now out of business) that is called, simply enough, green chai. This tea contains the following ingredients : Contains green tea, cinnamon, vanilla, cloves, almond pieces, rose petals, and all natural flavors. I do like green tea, particularly the quality loose-leaf versions. Yet, at times, I want something with a bit differnet flavor than is found in a pure green tea. But at the same time, I want the health benefits of green tea. For this reason, I'm always open to trying new green teas that have a totally different flavor to them. And this tea from the Dragonwater Tea Company (now out of business) didn't disappoint me. Straight out of the bag this tea simply smelled superb. When you open up the bag you'll be greeted by a somewhat spicy aroma of cinnamon along with the delightful aroma of vanilla and even a bit of rose. And the flavor of the tea didn't disappoint either. Now admittedly, I found the taste to be different than I was expecting...but that isn't a bad thing in and of itself. First off, this is not really a spicy tea, despite being a "chai tea." The spice in this tea is more in its aroma, not in its flavor. When drinking this tea, if you didn't know the name or taken a whiff of its aroma, you would be hard pressed to say that is a "chai tea," let alone a "spicy tea." Yet, that didn't disappoint me. The flavor of this tea is, quite simply, excellent. You'll find the traditional flavor of a green tea, along with sublte hints of vanilla, cinnamon and the very slight flowery taste of rose even. And, also quite nice, the taste has a very light taste in general...it isn't heavy. Because of this, I simply found this tea "rather comforting" in a odd sort of way. The after-taste of this tea is also quite nice. The after-taste is not strong, nor does it linger around too long. But, the after-taste is not better, and has an intriguing flavor that is best experienced and not described. Recommendation : Yes. This tea makes for a pleasant switch away froma traditional green tea if you are in the mood. The tea is not spicy. Instead, the tea has a unique flavor all its own that I suspect most chai tea drinkers and even most green tea drinkers will enjoy. 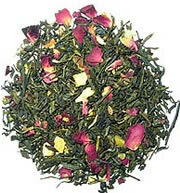 Mighty Leaf Mountain Spring Jasmine Green Tea : A superb and very flavorful jasmine green tea.